So... I thought a lot about whether or not I was still going to feature my Birchboxes on the blog since they're leaving the Canadian market and there will only be one more box for us Canadians after this... but then I decided that since I've been with Birchbox since the beginning I would just be there until the end as well. So keep in mind as you read this that the box will be gone after next month (EDIT: Apparently Birchbox changed their statement after releasing it and made February the last box, guaranteeing that if they ever come back to Canada, they will not be getting my business.) 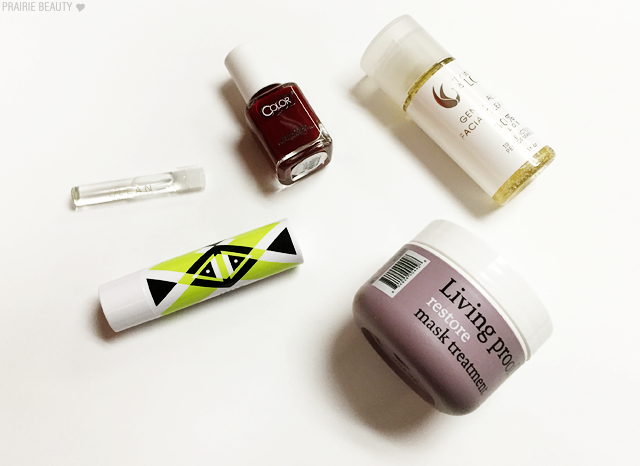 If any of the product interest you, they might be worth spending your Birchbox points on! Brightsides! There won't be an Ipsy vs. Birchbox post next month, because I feel like that was about deciding between the two services and there's really no point in that anymore. 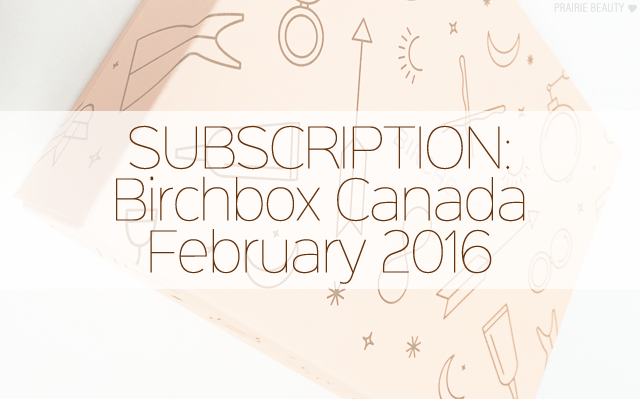 Anyway, if you're interested in seeing what I got in my February Birchbox, keep reading! This superhydrating formula adjusts to your pH, enhancing each wearers natural lip color to create the perfect hue. The color enhancing effect of this product is quite subtle and a little bit odd, I have to say. However, on the lips this does feel hydrating and it's thick enough that it really feels like it creates a barrier. This was my Sample Choice pick this month, because I was curious. Top notes of bergamot, mandarin, and black pepper are followed by notes of magnolia, lily, and vanilla orchid. I love CLEAN fragrances, so I probably would have been really happy about this... if this wasn't the third month in a row that I got a fragrance sample. Also, still think all fragrance samples should have a spray nozzle. You'll love the lush lacquer color in this vegan, 100% cruelty-free nail polish. This is a pretty colour and seems to be a nice formula from swatching it on one of my nails. I suspect it's going to take a while to dry, but I think I'll like the finish. This was in Sample Choice this month - and I didn't choose it. Just saying. Made with 30 percent aloe vera, this foaming wash cleans, calms, and rebalances skin. I stopped using foaming facial cleansers a while ago because I find them stripping, so it's pretty unlikely that I'll use this. I will probably pass it along to someone. This mask not only repairs dry, damaged hair, it also makes it up to 20 times stronger. I'm actually quite happy with this sample. I'll probably only get one or two uses out of it, but it's worth trying out to see how I like it and if there's any point in shelling out for the $53 full size! ... Yeah, I got a little lazy with the photos this month. 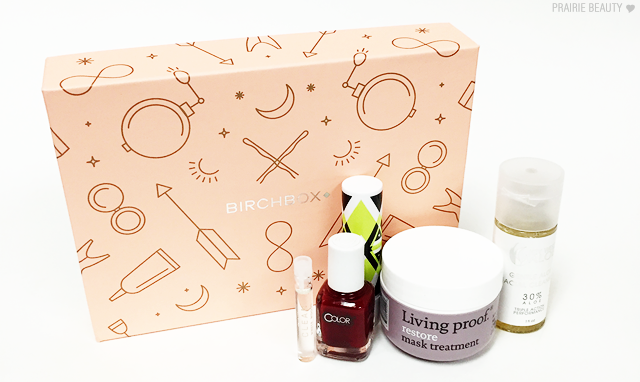 I'm really not sure whether it's a good thing or a bad thing that Birchbox Canada really isn't knocking it out of the park on their way out the door. I assume they had this box planned, so maybe next month they'll be extra nice and send the remaining subscribers a special farewell box. One can hope! <--- Nope. See edit above. One thing I'm a little annoyed with this month is that I got 2 of the sample choice picks... What was the point of doing sample choice if I'm still going to get one that I didn't pick? Anyway, thanks for reading! Bye, Birchbox. You seriously sucked on the way out!